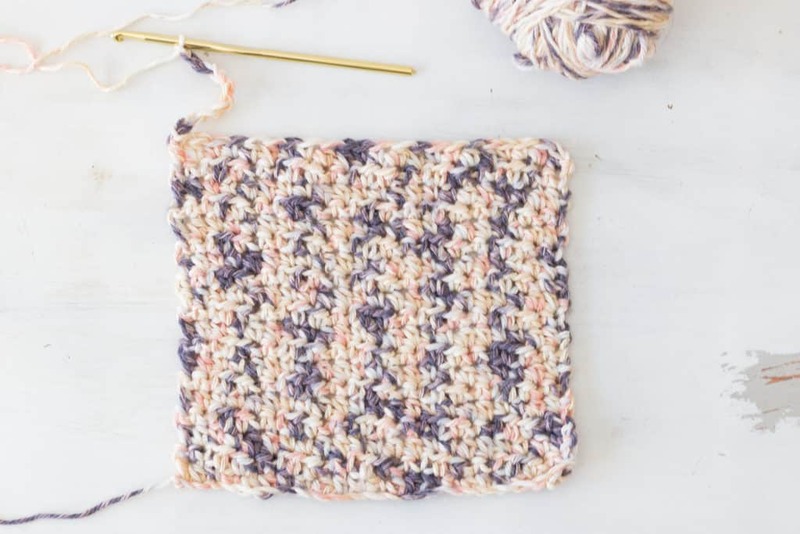 Are you excited to make one of the easiest crochet potholders ever? 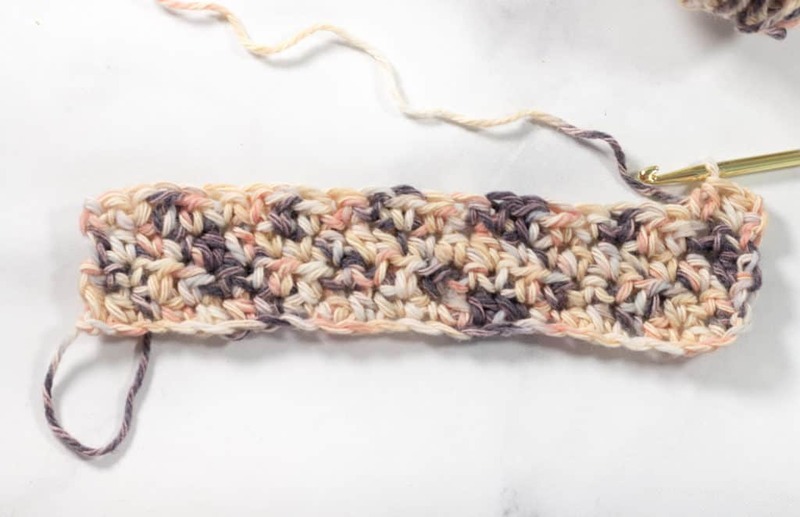 This easy crochet pattern is super simple and uses only TWO stitches! 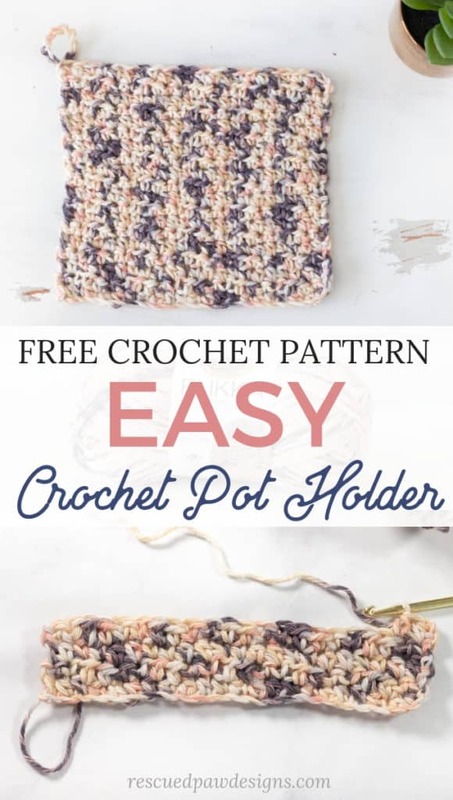 Just like my other hotpads / potholder designs this simple pot holder pattern is great to work up as a gift! 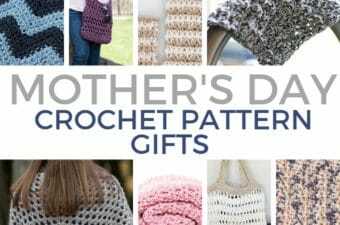 It would be perfect for Mother’s day, birthdays or as a housewarming gift. And while you’re at it don’t forget about making one for yourself too! These Pot Holders have many uses! This pattern along with being a great pot holder is also great for sitting hot pans on after they are taken out of the oven. 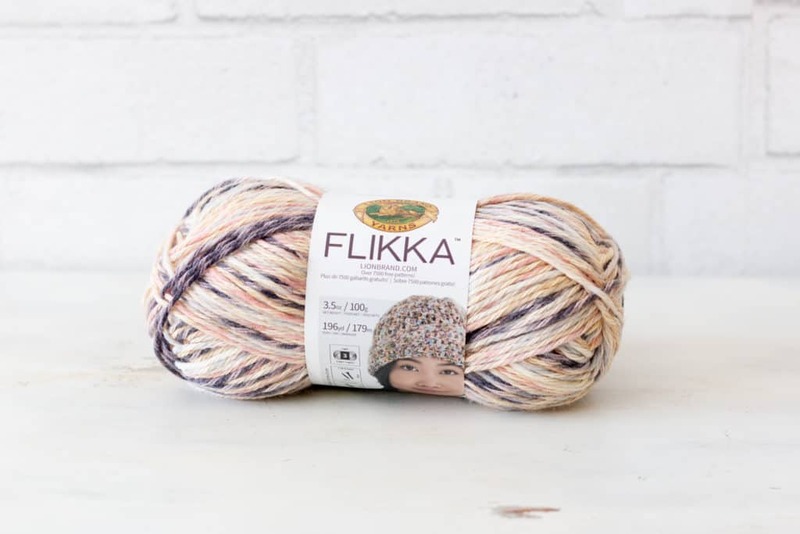 I would recommend using these with low temp items (below 220 degrees) if you decided to use the same yarn as me. If you’d like one that will hold hotter items then I would recommend a 100% cotton fiber such as Cotton Jeans from Lion Brand. 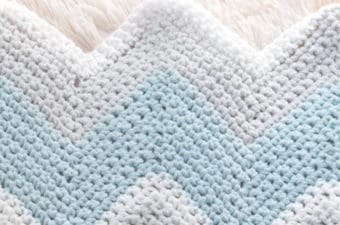 You can also use them as a washcloth, dishcloth and a cleaning rag too! I went with Flikka Yarn from Lion Brand in the color-way KeepSake for this design because I love the mixture of colors each skein has! If you’d prefer to make this is a different color then you are in luck because their are so many pretty ones to chose from in this line. It is a combination of cotton & polyester plus it is machine washable and dryable which is perfect for any kind of material used in the kitchen! 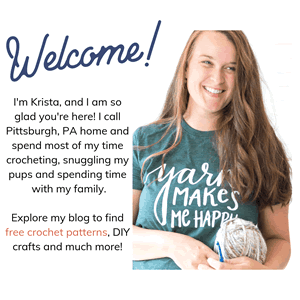 Want a double thick crochet potholder pattern instead? If you’d like to make this pot holder a little thicker I recommended just crocheting the pattern as written but holding two skeins of yarn together at the same time. I think doing this will make it the perfect thickness for those extra heavy and hot pans you need to move. First I chained 23 and then did a repeat of 2 half double crochets and single crochets the whole way across the first row. I then turned my work and chained 1 to begin the next row. 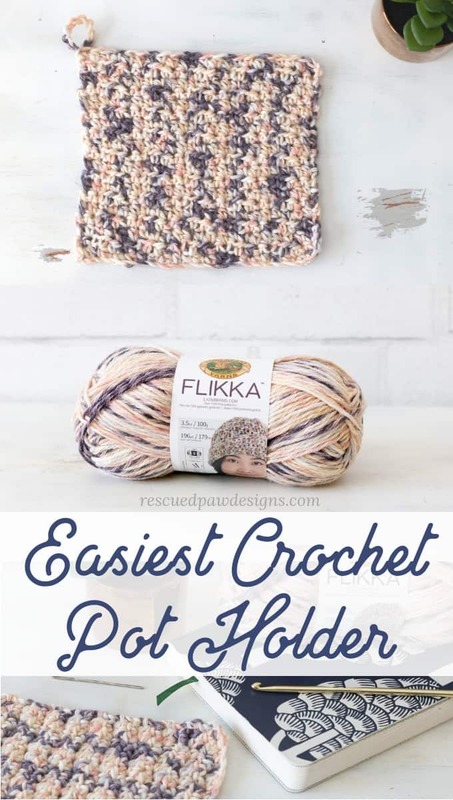 The next row is “almost” the same as the first expect you will be starting with 2 single crochets and then working up 2 half double crochets instead. 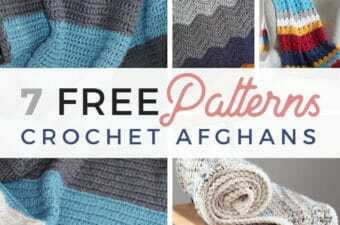 You will repeat the simple pattern of row 1 and row 2 throughout the entire pattern until you come to row 19. 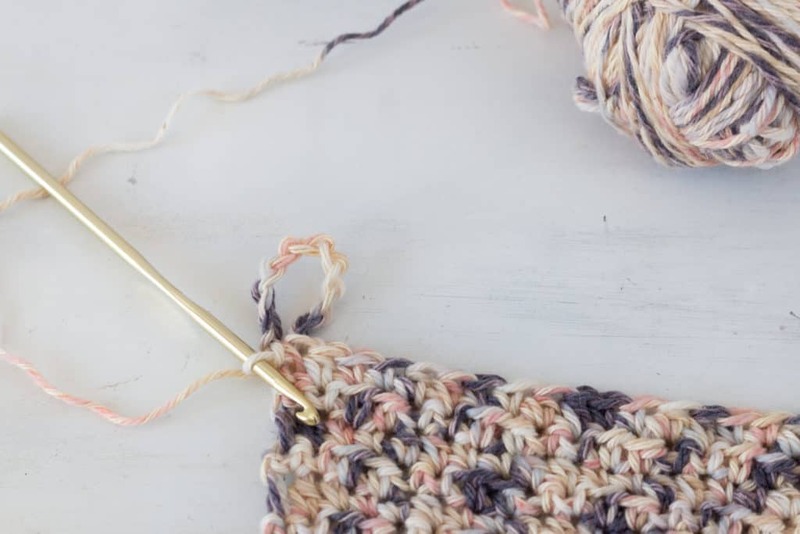 At the end of row 19 instead of fastening off your work you will now chain 10 and attached to the same stitch with a slip stitch to make a chained loop so you will be able to hang up your potholder. Chained hanger: At the end of row 19 ch 10 sl st back into the last st of row 19. 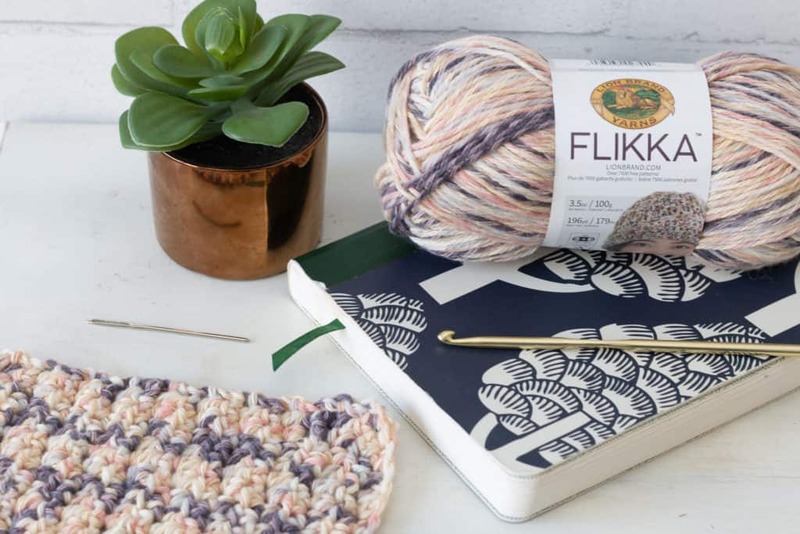 Finishing: Fasten off and weave in loose ends throughout the potholder with a yarn needle. 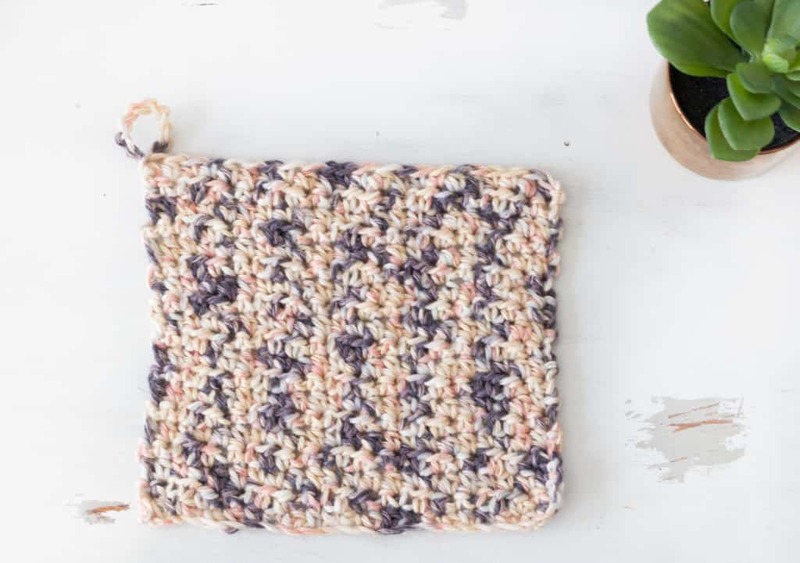 You are done and I am so glad I was able to teach you how to crochet this easy potholder!